As you will notice throughout my previous and upcoming Moving Well articles, I continuously stress how exercise is a key component to improving your wellbeing. Modern diseases, at least 70 % of them, can be linked directly to present day life style choices. We simply do not move and exercise in a way that we were genetically “wired” to. Combined with our choices of diet, thought and “stress” patterns, we have a formula for sickness and disease. The aforementioned JAMA study was conducted between 2004 and 2007, in Perth, Western Australia. Researchers reviewed the results of 138 participants who completed an 18-month assessment. The average age of the participants was 69 years. All reported some degree of memory problems, but did not meet the criteria to be classified as having dementia. Participants were placed into one of two groups. 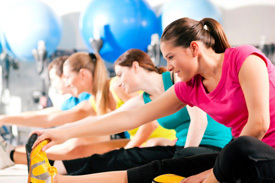 One group, which researchers called the “usual care group”, was given activities described as “education” while the second group was assigned to an activity or exercise program. This second group exercised 142 more minutes each week, or 20 more minutes per day, than those in the “usual care group”. Interestingly, the activity that was most frequently employed by the activity group was WALKING. The brain is like a battery. It needs to be “charged” on a regular basis and the way that happens is through stimulation…. the firing of nerve endings in the body. How does this happen? Through MOVEMENT/EXCERCISE!!! As we approach the colder months, we may not be able to spend as much time outdoors, when the idea of walking as a form of exercise becomes less appealing. There are other ways however, where we can get the kind of “nerve stimulation” or “exercise” that we need. We have an excellent full service health club here in town, Movati Athletic. The pool and water programs are an excellent alternative during the winter months. Another option is to consider the WAVE machines we have in our office. Research has shown that in 12 minutes you can receive the same benefits of a 1-hour gym workout. In addition all kinds of health studies have been done and are ongoing on the health, functional and neurological benefits of vibration therapy/exercise. The nice thing is that regardless of your health or fitness level, mostly anyone can participate. Contact us at the Family Chiropractic Wellness Centre for more information on this therapy device. If interested, book a consultation, and we will see how we can incorporate the WAVE into your chiropractic and therapy regiment. In my mind, there is no greater investment that you can make than an investment in your health. Do something!!!! I’m sure you’ll see me write about how movement is good for you again and again, friends. We all need to move… it’s one of our 4 pillars of health!! (Moving Well, Thinking Well, Eating Well, and Living Well).